CouponsToTroops (www.facebook.com/couponstotroops) is looking to spread awareness about overseas military families being able to use coupons those expired coupons, and to take it one step further. 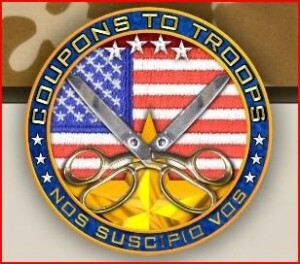 Their ultimate goal to get coupons right into the hands of those military families as quickly as possible. They have a growing list of military families on their contact list who are interested in receiving coupons and they will match up anyone requesting a military family to send their coupons to. To request a family, all anyone has to do is send an email to them at [email protected] and they will put you in touch with a military family. By being paired directly with a military family, your coupons will get there quicker and you will know they are going into the hands of someone who wants (and needs) them! This is an incredible opportunity to turn your trash into cash, and provide an incredible help to our brave men and women who are serving our country overseas! I’m from Guam and I could use those expired coupons. You can send them to me. I’ll send you my address if you’d like to send them my way! Thanks! How fantastic! I just sent an email and looking forward to blessing someone else with the coupons I couldn’t use!